Posted April 20, 2016 by Bailey Heard & filed under Blog, FeaturedOnHomePage. Hello! I’m writing to you from my home away from home, Cuero, TX. I’m really looking forward to speaking in Victoria, TX on Wednesday. For now, though, I’m sitting in my late husband, Andrew’s, favorite recliner with his Texas Tech blanket draped across my legs in the home he grew up in, and in the very room where we said our final goodbyes. It’s always emotional for me to come back to this place. I have some sad memories here, but I also have many priceless memories of our final months together as a family. There’s something about this special place that brings peace to my heart, grounds me, makes time stop, allows me to breathe, and reminds me everything will be OK.
My creative mind soaks up the silence and my imagination runs free. It’s my favorite place to write. After all, this is where I birthed the idea of sharing my life’s journey with you four years ago in the form of my blog. Not knowing my life was about to be turned upside down. This week was a reminder of how much my life has changed. I started setting up the table with the books when a familiar face started walking up to me. She was the mother of two students who were in the youth group during Andrew’s ministry. She began sharing with me the impact Andrew’s life and faith had on her son and daughter. She expressed eternal gratitude for Andrew’s influence, love, and encouragement in their lives. I remember when both of her kids came to visit Andrew in Cuero during the final months of his life. I let her know how much their visit meant to both Andrew and me. I told her how I didn’t know I would be speaking in this room, and the combination of that reality and the kind words she had just spoken about my husband overwhelmed my heart with emotion. She hugged me tightly as my eyes filled with tears. Then, one of my Baylor college roommates walked through the door and immediately my heart was calmed by her presence. There were many Baylor Bears in the room that day, which made me feel right at home. By God’s grace, I got through my speech without losing it completely. Once I finished I told the group how important this moment was for me because my life had come full circle. Here I was, standing in the very place my husband stood five years ago, and now I was the one speaking on his behalf, carrying on his legacy of love. I said, “I hope he is proud.” The loving responses from the women filled my heart, and reminded me why I continually share our story and the powerful message I’ve been given to inspire hope, faith, and courage in the lives of others. Truly appreciate and value the time you’ve spent with me today. Beyond grateful for YOU! Blessings. PS –Do you or someone you know have a group in need of an inspirational speaker? 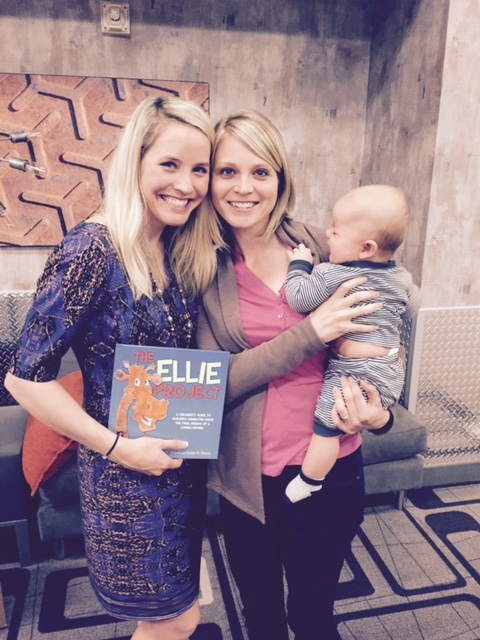 If you want me to come speak and sign some Ellie Project books, shoot me an email at bailey@baileyheard.com. My presentation is powerful, inspirational, and about living your legacy today! It’s good for men and women, corporate groups, mom’s groups, Bible Study groups, community groups, etc. I am excited to come share this powerful message with you!